We offer all residents of Surrey a quality gutter and soffit replacement service, installing the guttering and fascia it vital to use a trusted business as incorrectly installed they can do more bad then good. Non running guttering leads to leaks and over flowing water which can cause serious problems to your properties foundations and could cost a lot to put right. And fascia is the same you need to treat the wood properly before putting the guttering up as it will not be weather shielded and will cause the wood to rot and eventually will be ineffective to support the guttering. We can also clad over your wooden fascia and soffits which will save on future maintenance costs, this is a UPVC cover for the wood which can last a lifetime if fitted by a quality tradesman. If you need any further assurances we can offer references from happy customers from all over Surrey. You can acquire a quote over the phone or by email, all quotes are free of charge and absolutely no obligation. Our Surrey gutter repair team have been sealing leaks for over 12 years we know the best methods and products on todays market meaning leaks stay fixed for longer also giving our customers great value for money in the long run. When repairing a gutter the materials you choose are very important, if you are repairing a previous leak that has mastic from the first repair still on there this will make a repair twice as hard. Sometimes its best to replace the leaky joiner, corner or outlet all together. Here is some free insight in to how us the professionals do it! for a first time repair on UPVC guttering choose a quality mastic, CT1 is a high quality product that will save you having to repair the leak again in a short period of time. Metal gutters there a pain to fix right? no not really the trick is to thoroughly clean the inside of the guttering then paint them with a quality sealant what product though? there is many to choose from we Recommend Cromapol as its a high quality fibreglass sealant that will last 10yrs plus, saving you future trips up the ladders and most roofing merchants stock it! We can offer free quotations to all Surrey residents by phone or email, hope you enjoyed the read up! Our Surrey guttering service have been efficiently cleaning gutters for well over 10 years, this means we are specialists in cleaning gutters regardless of shape, size and height of the guttering. Choosing the correct method to clean the guttering out is vital as a gutter vacuum system is a very hand pice of machinery but is not always effective when cleaning downpipes or big clumps of turf that can form in some cases. We Use ladders and Extension poles and unblock downpipes by hand as this is the only certain way of making sure there is no build up in there. 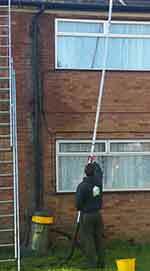 Cleaning gutters does not seem like anything complicated but without general knowledge like our specialists have you might miss something that can cause a block or a leak in the near future. All our staff are HSE trained meaning we specialise in cleaning gutters at height safely and efficiently, not to mention all having 5 million pounds liability insurance in the unlikely event there is any damage caused to your property. With there being no shortage of dodgy tradesmen in any line of work now a days who can you really trust? Well there are a few ways of making sure you choose the right company 1. are they registered 2. ask for a UTR number at least you know the business has been registered with HM revenues 3. references ask for some local to your address 3. ask for a copy of their liability insurance as any decent tradesman should have it. Also don`t think all companies on sites like TrustaTrader and Rated people are trust worthy unfortunately even these sites are not fool proof although it is less likely to find a rogue trader on their sites reviews left on there can easily be done from non clients. This is mainly all common sense but i hope these few pointers help you out in your decision making.